My hair has a love-hate relationship with hairspray, sometimes they co-operate, other times they don’t. Normally hairspray likes to especially fail on me on that one time in a blue moon when you actually have a good hair day. Back in the day when I was at school near enough every day my hair would be caked in hairspray (don’t judge me that’s what was fashionable), however on a daily basis I very rarely use it, it’s normally just on nights out. 99.9% of the time you will have noticed that on nights out I always wear my hair curly, and no hairspray has managed to keep the curl in my hair for a decent length of time. 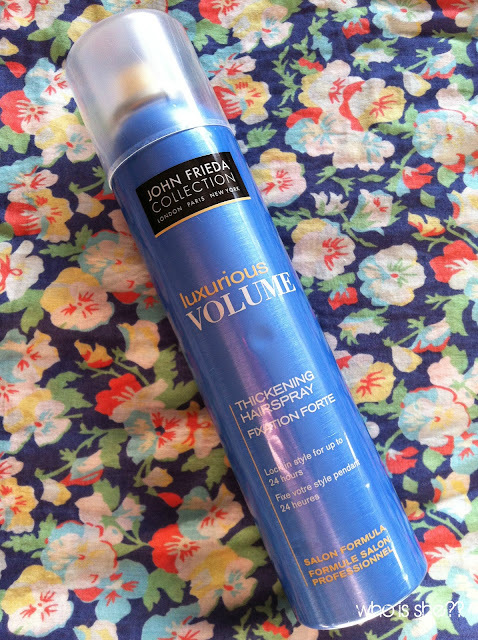 I’d received this a few months ago and I’ve never really used it that much, however for nights out I’ve been reaching for John Frieda’s Luxurious Volume Thickening hairspray*. While on nights out (with the beer goggles on) I never paid much attention to how my hair has been looking as the evening progresses, however looking back over photos- you can see this on my recent night time outfit posts, my hair is looking good and my curls are still in place. Personally I haven’t noticed any major difference in volume on my roots, however my curls look fuller. So even though I can’t promise volume, I do think it does a brilliant job of keeping my hair in place. I do feel that my hair the next morning is rather dry from the product, however its easily brushed out. Would I repurchase? Definitely. This currently retails for £5.79 although all John Frieda products are currently on offer 2 for £7.50 in Boots.